While in Italy this past October I had booked my flights with Alitalia. 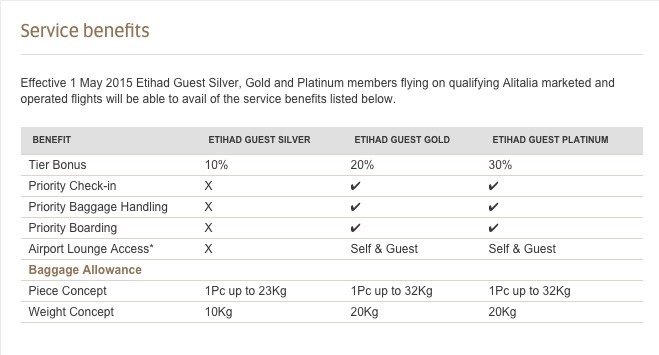 I don’t travel often on Alitalia and I don’t have status with them, however I did a status match recently with Etihad for an Etihad Gold level. I do travel with Etihad and it was a great perk to have for lounge access. However this also turned out to be a great perk in one other way since Etihad partially owns Alitalia and they are a mutual partnership. Which allows you to enjoy some of your status bonuses. Here is what you get when you are travelling with Alitalia on International flights. You can use your Etihad status to check in your bags via the business class counter even if you are travelling in economy plus 10kg or more extra allowance. You can also fast track through security which I did in Venice and Rome. You also have lounge access if you are travelling on an International flight and a right to one extra guest. Note that it is only available if your flight is operated by Alitalia. This proved particularly good for me since we almost missed our flight from Rome to Sofia and we did use the fast track lane.